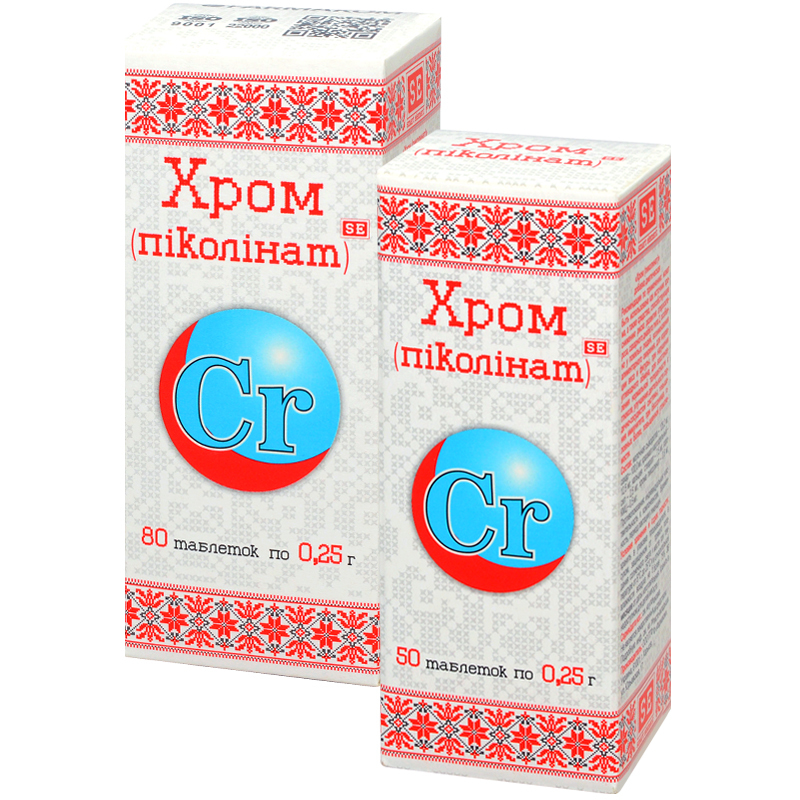 Source of chromium. It provides for improvement of metabolism, normalization of carbohydrate metabolism, improvement of pancreas function, immunity boosting. Whey — 126.2 mg, sugar — 100.0 mg, potato starch — 12.5 mg, calcium stearate — 7.5 mg, Aerosil — 2.5 mg, chromium picolinate— 0.8 mg, CMC — 0.5 mg.
Chromium improves insulin sensitivity and reduces blood sugar level. Chromium contributes to forming necessary insulin form, what contributes to improving glucose permeability to the cells under the influence of this hormone; the element intensifies glucose converting into glycogen, stimulates lipolysis, reduces blood cholesterol and LDL (low density lipoproteins) levels. Chromium affects the state of tissues, cells, intracellular metabolism, intensifies body defenses; it is important for enzymes and hormonal metabolism. Chromium deficiency in the body leads to protein dysmetabolism, what is accompanied by development of various asthenic and vegetative reactions (nervousness, depression, general weakness, anxiety, insomnia, headaches), increases the risk of CAD, diabetes mellitus significantly, promotes weight gain. Chromium helps overcoming stress, improves digestion and reduces appetite, hankering for bakery, confectionery, promotes weight reduction, improves constitution, makes skin and muscles elastic and stiff. Dietary supplement normalizes lipid and carbohydrate metabolism, replenishes chromium deficiency (which is an essential microelement). It has soft, rather stable anorectic effect (relieving feeling of hunger), which is preserved throughout the day. This effect is conditioned by the effect of chromium on insulin sensitive mechanisms of appetite regulation. Adults take 1-2 tablets a day with food. Term of use and the possibility of repeated use are to be agreed with a doctor. Proteins – 0.405 g, carbohydrates – 45.5 g, fats – 0.1g.